Even though I’m not at all a fussy eater, I rarely eat meat. It’s not that I don’t like it, but I usually find myself gravitating more towards vegetable or fish when cooking and eating out. The way I eat and cook has been greatly influenced by my parents’ dietary habits: while I was exposed from very early on to various cuisines and ingredients, meat was never on top of the list of foods we’d have, either at home or out. My mom, who always did the cooking, loves vegetables and fish, spices and fresh herbs and dislikes eggs; my dad, who never did any cooking, could happily eat eggs for days on end, his idea of a feast is pieces of cheese, olives and some good bread and never misses a chance to declare how much he loathes chicken. Neither has very strong feelings towards red meat, but they both enjoy the preparation that goes into making a good meat dish. So meat would appeared on the table either when we were on our country house, after being cooked in our outdoors wood fired oven, or during the winter, for large gatherings, when my mom would prepare a hearty meat stew or a roast, with lots of seasonal vegetables and dried fruit. 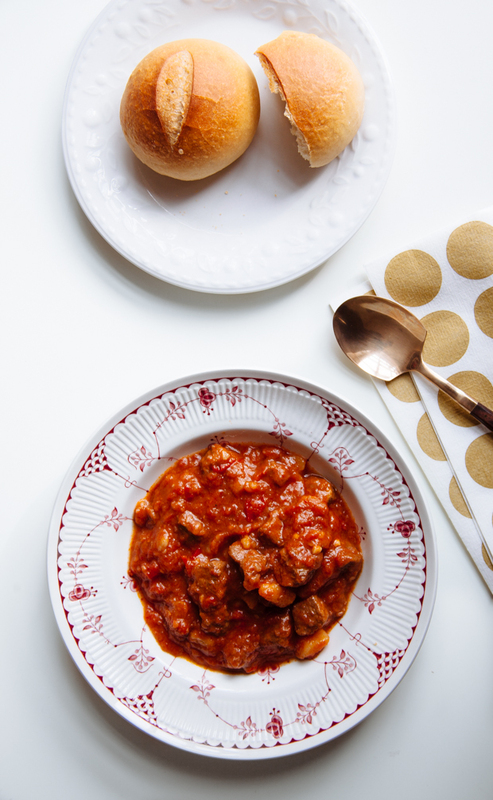 My favourite of those meat dishes is her version of the Hungarian Goulash, which she usually make the night before serving it; this intensifies the flavours of the dish and brings them all together, but of course you can also make it on the same day you serve it. 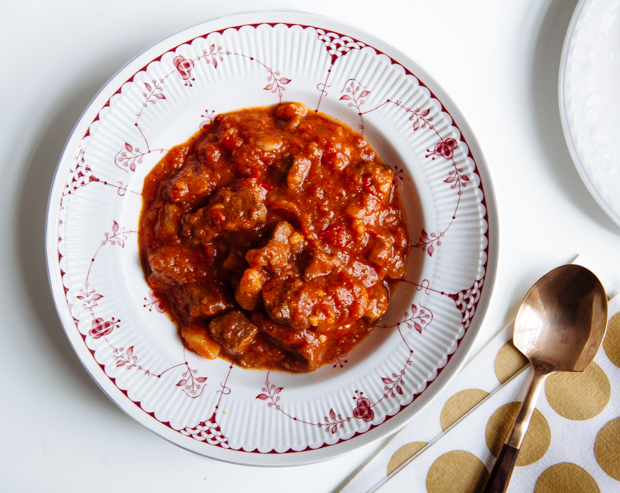 It’s thick and hearty, more of a stew than a soup, filled with small pieces of beef, onion, garlic, carrots and potatoes to thicken the broth, and seasoned with bay leaves, lots of paprika, a pinch of cayenne and black pepper. She nails it every time. And every time I have that first bite, I mean every time, I wonder why I don’t eat meat more often. In a large, heavy pot, warm the butter and oil over medium heat; once the butter is melted, add the onions and garlic and sauté until soft. Add the meat and sear for about 5 minutes, until lightly browned. Add the potatoes, carrots, pepper and wine, bring to a boil and cook for another 10 minutes. 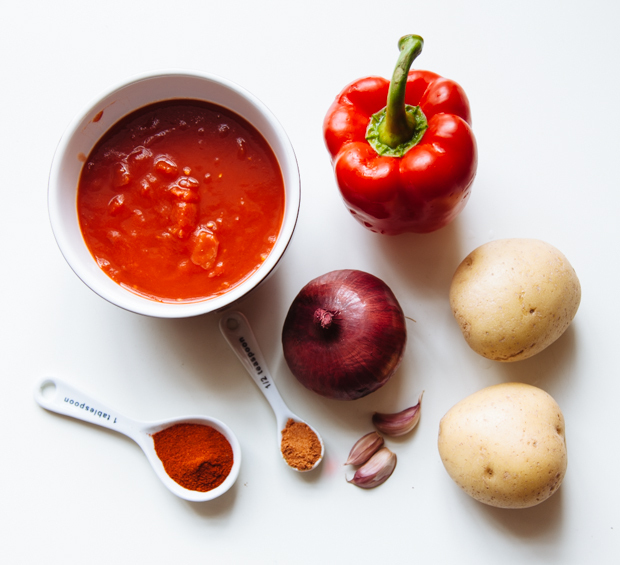 Finally, add the chopped tomatoes, sugar, bay leaves and beef stock (enough to cover the meat and vegetables, you may not need all 6 cups) and season with the paprika, cayenne, black pepper and salt. Reduce the heat to a soft simmer, cover with the lid and braise for 1,5- 2 hours, until the meat is tender. Serve on its own, with thick slices of bread, to soak up the sauce.